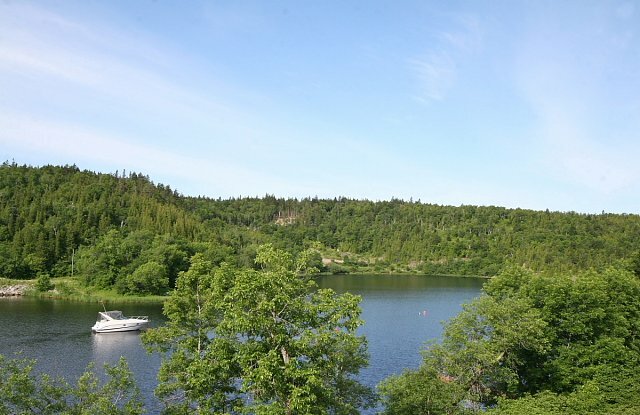 This custom quality-built condominium with Cape Cod siding and stone façade located in the Highlands of Drury Cove overlooking the water leaves you breathless the moment you walk in the door! From the moment you enter the foyer you see straight across the open concept design past the dining and great room through the oversized windows to the serenity of Drury Cove right at your doorstep! Highest quality construction. No detail will be overlooked with your choice of porcelain or ceramic floors in the foyer and bathrooms to the tray ceilings in the great room and dining room. The main floor features hardwood flooring, oversized moldings and nine foot ceilings throughout. Your choice of custom designed kitchen cabinets with quartz, granite or Corian countertops, glass backsplash and large central-island is a wonderful space for the gourmet cook. With plenty of natural light and open concept, this will be sure to be a favourite spot to whip up interesting evening meals and appetizers alike. The great room boasts an eleven foot tray ceiling, cozy propane fireplace, two walls of glass overlooking the cove and deck access via the garden door making entertaining friends and family inside and out a breeze! The deck is no-maintenance with vinyl floor covering, aluminum rails and glass panels to ensure that your water view is not obscured! The great room is open to the large dining area also with eleven foot tray ceiling and your choice of chandelier. The dining room is stunning and lends itself to a sophisticated feel of style and elegance for any dinner party! The main floor master bedroom features a large walk-through closet with a window, patio door access to the deck and a five-piece ensuite bath. The ensuite with porcelain flooring has one-piece molded double Corian sinks, Corian countertop, deep soaker tub and separate tiled shower. This mater bath sets the mood for relaxing down time, quietly away from the main living space. The laundry room is conveniently located directly off the master suite close to the bedding and the towels! There is an additional flex room on the main level with large window and double closet which can be utilized as a den, home office or quiet bedroom the choice is yours! Located near this room is a guest powder room. The daylight walkout basement is nothing short of impressive! With huge sunny windows, high nine foot ceilings and easy access to the lower covered patio (perfect for those who want to stay out of the sun). Here you will find a huge space all ready for you to finish with whatever rooms you choose all with large spans of glass overlooking the water. There is plenty of storage space here and the mechanical is located in this area with heat pump and 200 amp entrance. This property is landscaped with sod and additional landscaping is at the buyer’s expense. The driveway is paved and the attached 2-car garage is fully finished, insulated, sheet rocked and heated! The home is heated by an economical heat pump which also provides refreshing air conditioning in warm summer months. There is a boat dock located right in front of this condo provided for the kayaker or canoer in your family! Condo fee of $375 per month includes lawn care, snow removal, water, sewer, roof, siding and exterior shell insurance that are included in the reserve fund. If you are looking for a stress-free lifestyle with every convenience at your finger-tips, a new beginning awaits you in the Highlands of Drury Cove! For inquiries or your viewing appointment call Katherine Bacon, designated Global Luxury Specialist™ at 506-650-8575 Voice/Text, 506-849-1678 Office and 1-877-676-0300 Toll Free Across North America.